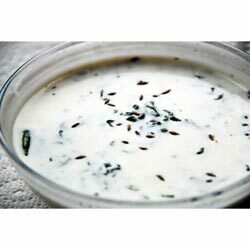 Spinach Raita is a yogurt based dish. This refreshing side dish is prepared by blending some spiced Spinach with plain Yogurt. Consistency of the Yogurt can be adjusted depending on how you serve it - can be served as Raita, dips to any veggie sticks or even Sandwich spread. "Dear Spices of India, Hi, order was received today, thank you very much for adding the last minute item especially as you kindly added it at no extra cost. Fantastic service, very much appreciated and I look forward to ordering from you again in the future. Best wishes,"